WormNAT2 is a WormKit module which enables players behind NAT or firewalls to host games which are joinable by everyone. It is a rewrite of the first WormNAT module, which required extensive configuration and that all players have the module installed. WormNAT2 works by asking a reverse proxy (which is running the HostingProxy software) to host the game for the player. A control connection is opened to the proxy server, proxy.wormnet.net on port 9301. As soon as the connection is established, the proxy assigns a port for the game and sends back the port number through the control connection. WormNAT2 creates the game at the address proxy.wormnet.net:port. 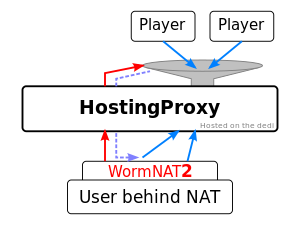 Once the game is created, every time a new player connects to the proxy, the proxy creates a new listening port for WormNAT2 and sends the port number through the control connection. WormNAT2 then connects to the specified port; the proxy then proceeds to route data between the two connections. Internally, WormNAT2 operates by monitoring WormNET game creation and closing. Incoming connections are simulated by creating actual connections from within the same process, and routing the data between those connections and connections to the proxy server. This page was last modified on 7 February 2016, at 18:32.